Now that fall is officially here to stay (my bare legs were not expecting those chilly, bitter winds this morning), everyone's running to update their fall wardrobe. Giant chunky sweaters, neutrals, dark shades of red, blues, and greens, I can't get enough of it. I'm on the look out for the perfect coat to carry me into the winter and the one above, from Choies, has me head over heels in love. Now to make sure it won't look oversized on my shorter frame. What are you guys craving? Whatever it is, you have a chance to win it. 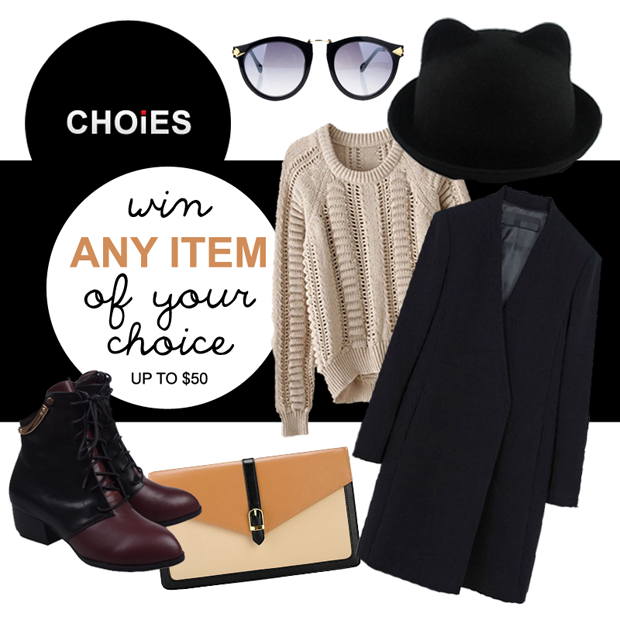 Choies is generously offering up an item from their website of your choice (priced up to $50) with a fall giveaway! I featured some of my favorite items up above but there's hundreds more to choose from. From graphic printed sweaters to leather boots, they will hook. you. up. Enter down below using the Rafflecopter widget!